For justice. For country. For love. After witnessing her friend’s sexual assault, seven-year senior Magdalena Wells escapes an attack with a few bruises and a thousand questions. As a journalist in practice, if not in pay, Mags vows to utilize the skills she mastered in the Democratic Republic of Congo and answer every single one—just as soon as she gets the hell out of town. Law Pierce’s aim is rest and relaxation after two years undercover in South Africa on an extended Base Branch mission, but restlessness puts him in trouble’s path. As a servant of justice, Law will do everything in his power to keep trouble safe. The fact that trouble’s petite stature and luscious curves stir his every primal instinct is a massive inconvenience he struggles to ignore. Together Magdalena and Law uncover a web of corruption and dirty lies that could set their country’s top official ablaze—if the inferno doesn’t consume them first. 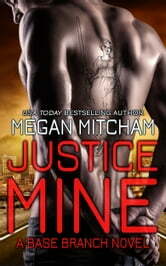 "Megan Mitcham's books are well-paced, well-plotted suspense novels edged with stunning sensual intensity. Her lovers are cold and deadly--except when they are skin-to-skin. I can't wait for the next book in the series!" Note: Each Base Branch novel stands alone, but is best enjoyed when read in order.